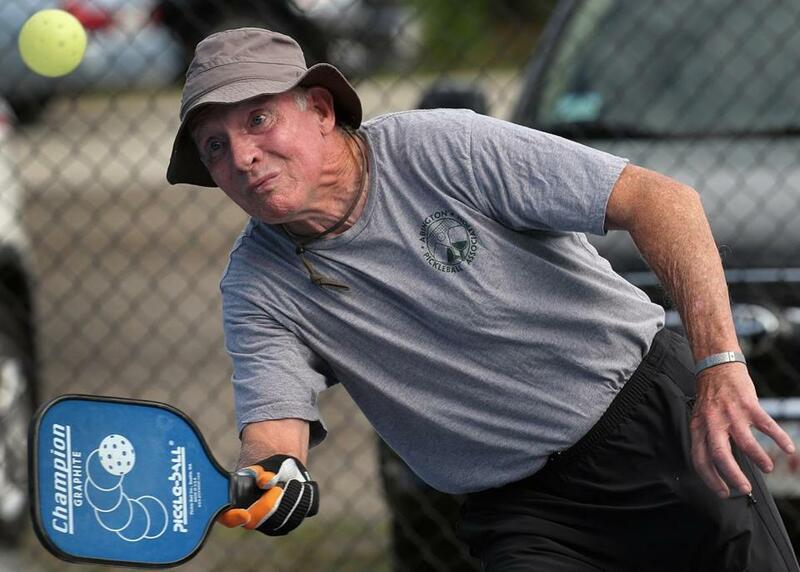 Bill McDonough of Rockland played a game of pickle ball earlier this month at the Abington Senior Center. Its enthusiasts call it the fastest-growing sport in America. It’s played in all 50 states and beyond, with tournaments staged in the US, Canada, Spain, and Jamaica. Locally, Abington has led the way, becoming the first town south of Boston to dedicate a regulation court to its play — three, in fact, in May. At least six other communities here use different venues — tennis courts, gymnasiums, even an ice rink — as temporary courts. Braintree wants to convert six tennis courts to meet the demand. And you say you’ve never heard of pickleball? The odd name? It has nothing to do with a cucumber steeped in vinegar and spices, and the ball used is hardly pickle-like. Nor was there a Mr. or Ms. Pickle present at its 1965 birth on an island not far from Seattle, Wash. But according to the USA Pickleball Association, one of the suburban dads credited with inventing the game did have a dog named Pickles who loved to chase the ball and run off with it. Thus, it is theorized, pickleball. If there’s a pickleball doyenne in the suburbs south of Boston, Ann Reilly, 75, of Abington most closely fits the bill. Reilly says she discovered the game just four years ago during a visit to Yarmouth on the Cape, when she played at the Flax Pond Recreation courts there, part of a town-run park. A year later, she started a program featuring indoor pickleball at Abington’s Woodsdale School. As the game took off in popularity, Reilly asked the Council on Aging for space behind the Abington Senior Center to build regulation courts. With $24,500 in private donations and an additional $15,000 of in-kind contributions, three regulation courts were dedicated in May. To date, they seem to be the only town-run courts south of Boston. In Braintree, which currently offers temporary space on two courts, the plan is to convert six tennis courts behind The Landmark apartments on Washington Street this fall. Many other towns — among them Marshfield, Kingston, Plymouth, Randolph, and Lakeville — use other venues for temporary courts. Towns exploring the possibility of building courts, said Reilly, include Weymouth, Hingham, and Milton. At the Abington courts, residents pay $10 a year and non-residents $35 to support equipment and court upkeep. Paddles and balls are offered to players for their use, but once most play, said Reilly, “they get hooked and buy their own equipment.” Paddles come in wood or polymer and start at about $30 but can get pricey, some costing over $100, she said. And membership has grown to more than 75 players. To a large extent, Reilly thinks, the attraction is a social one. Paul Lavoie, a 73-year-old from Brockton who used to simply walk for exercise, agrees.